I don’t think politically you can cut those programs. Train wreck is a way overused metaphor, but we’re headed for some kind of collision, and there are three things that can happen. Just by the arithmetic, you can either have big tax increases, roll back the whole Bush program plus some; or you can sharply cut Medicare and Social Security, because that’s where the money is; or the U.S. just tootles along until we actually have a financial crisis where the marginal buyer of U.S. treasury bills, which is actually the Reserve Bank of China, says, we don’t trust these guys anymore — and we turn into Argentina. All three of those are clearly impossible, and yet one of them has to happen, so, your choice. Which one? I think financial crisis, and then how it falls out is 50-50, either New New Deal or back to McKinley, and I think it’s anybody’s guess which one of those it is….I don’t see any noncatastrophic solution to this, I don’t see an incremental stepwise resolution. I think something drastic is really going to happen. ….What happens if  foreign countries stop buying U.S. bonds? Is this a real concern, or a tinfoil hat kind of thing? 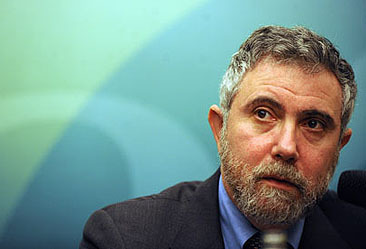 ….If you were king of the economy, what’s the Krugman plan? A phased elimination of all the Bush tax cuts, plus some additional taxes. I’d probably look first at some way to make the corporate profits tax actually effective again — the nominal rate is 35% but the effective rate is only 15% or so. Look at some cuts, maybe you start to talk about retirement age, and possibly some means testing of Medicare, and that’s enough to bring the budget under control. Obviously the financial crisis of 2008 has intervened since then, but I wonder how much of this still represents Krugman’s current thinking?